West Michigan Sand Dragway opened in 1983, and has since become one of the premier sand drag facilities in the United States. The racecars vary from ATVs to dune buggies and all the way up to top fuel dragsters reaching speeds of 120mph+ in under 3 seconds, on sand! Owners Jim & Judi Briggs and family strive to make the West Michigan Sand Dragway the best sand drag racing facility in operation. Their goal is to create a high energy environment for top-notch competition while still maintaining a friendly, family-oriented atmosphere. 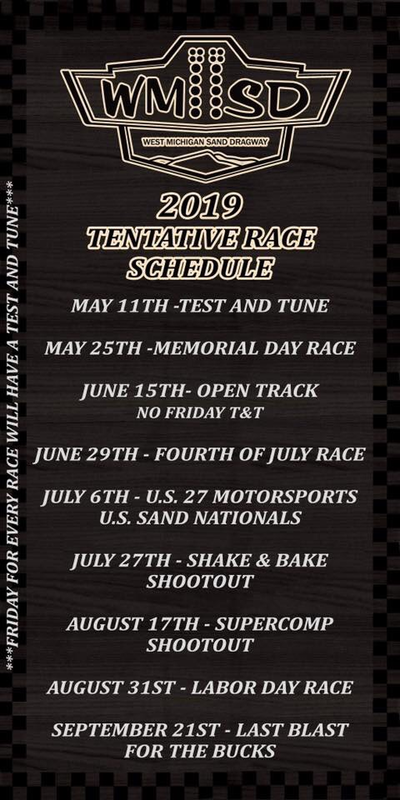 If you are in the Silver Lake area and looking for an exciting, family friendly activity, look no further than West Michigan Sand Dragway. The track is only a few minutes from the Silver Lake sand dunes and offers high octane entertainment and top notch amenities. Those amenities include a full modern concession stand with a variety of food and beverages to choose from, modern bathrooms, Souvenir and T-shirt shop and bleachers to watch all the racing actions.